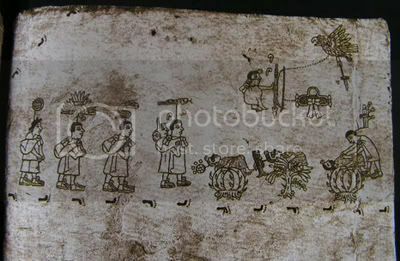 Pages from Codex Boturini about the Journey from Aztlan. In old books, Aztlan is spelt Aztatlan. Many people don't really know what Aztlan is. Many people today use the term Aztlan to refer to the south west which was once Mexico but was taken by the US. People claim it's somewhere in the US or Mexico. With it's origin, it is said that eight tribes left Aztatlan. 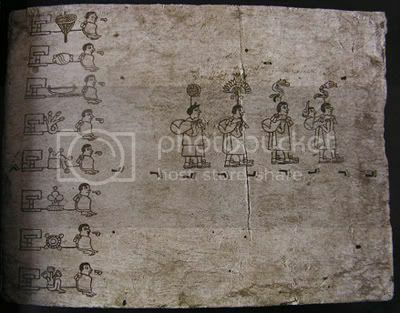 These eight tribes origins are from the Chicomoztoc (7 caves). One thing that we see in the codex is a priestess called Chimalma (Reposing Shield). 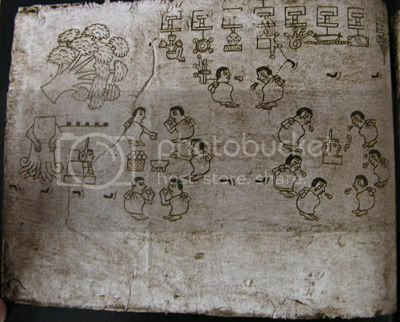 She is the woman you see on the first page on the left side of the island and she's the last one in the group of the four teomama with Tezcacoatl (Mirror Snake) leading the way. For nearly 550 years people from different places have been looking for Aztlan. 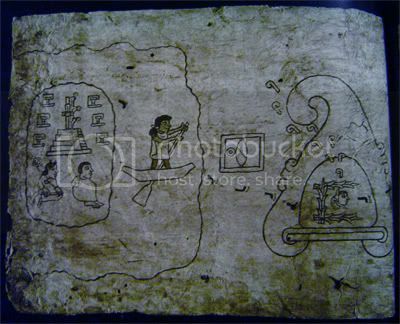 First known is in 1440's during the time of the Mexica Tlahtoani Moctezuma because in 1433 Tlacael ordered Itzcoatl to burn the books of the Mexica and Tepaneca. Moctezuma wanted to learn more about the Mexica past. He sent 60 wise men to find Aztlan. Supposedly, while they were searching, they encountered a supernatural being which transformed them into birds which they flew to Aztlan. They turned back into humans They encountered the mother of Huitzilopochtli. She scolded them because they were living a "soft and luxurious life in Tenochtitlan." She also prophecized that "they would be conquered one day just as they had conquered others." After the 60 wise men left Aztlan, they transformed into birds again and went back to Tenochtitlan. When they arrived, they turned back into humans and told Moctezuma what had happened. Though many people see this as a story, others see this story as part true. Aztlan and Chicomoztoc will be twisted by the Spanish. To the Spanish, they believed that the 7 caves were actually the 7 golden cities from their legend (Cibola, many know this legend as El Dorado). They twisted it because they used Aztlan as a "marker". If they found Aztlan then Chicomoztoc should be near by.